Duct Cleaning Ottawa | About Us | Capital Chimney Sweep Inc.
Denis Ste. Marie, founder and operator of Capital Chimney Sweep, received training and certification in Stowe, Vermont, in 1976. He later launched a small chimney sweep business on Montreal’s West Island which relocated to Ottawa in 1980. Capital Chimney Sweep started on the road and became one of the largest and most successful chimney cleaning companies in the region. Over the years, it has increased its customer base and has been able to expand into other related fields. 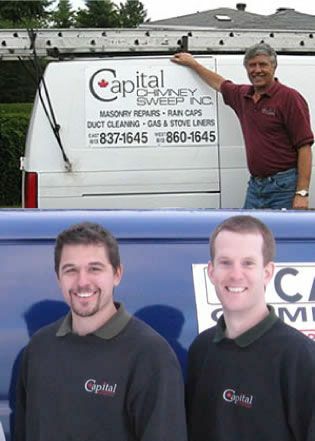 Chris James and Eric Cantin took over Capital Chimney operations in 2012. The co-owners are both fully trained, WETT-certified technicians. Together, they have 21 years of experience in the field.